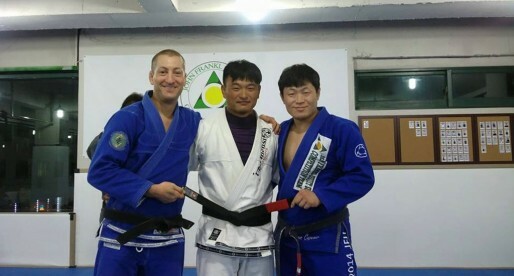 Eduardo “Jamelão” da Conceição is a historical Jiu Jitsu black belt under Romero Cavalcanti. Famed for being the “enfant terrible” of the Alliance team for years, Jamelao won several important titles such as the Brazilian National and beat some of the best fighters of his generation, people like Nino Schembri, Fernando Margarida, Jean Jacques Machado and many others.. Nickname: “Jamelão” is the name of a very dark fruit, in Brazil often associated with people of darker skin. Favorite Position/Technique: Half Guard, Cadeirinha sweep. Eduardo da Conceição was born in Rio de Janeiro, Brazil in 1974. 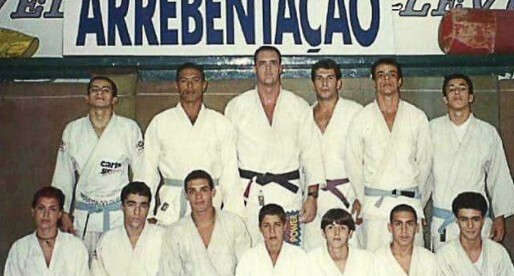 He started training Jiu Jitsu as a child, after a couple of his friends (Edson and Ralf Pires) made an invitation to join them for a BJJ class at Jorge Pereira’s academy, a class led by Silvio Behring. Eduardo loved it and stayed at this same gym until he received his yellow belt. After he received his yellow belt, he moved to Romero Cavalcanti’s gym. He did not have any money, so he asked Cavalcanti if he could stay at the academy for free, doing maintenance work at the gym to pay for his tuition, Romero agreed. Also Working as a caretaker at the same time in an upper class house, Jamelao soon became one of the better competitors in the Alliance team, he managed to travel for competitions and study at the same time for many years, this happened mainly due to the help provided by his boss. Unfortunately for Eduardo, as his employer passed away he was left without a steady income and needed to move to Vitoria in the state of Espirito Santo where he opened his own academy. At Vitoria he found many established rival academies, being Rafael “Capoeira” possibly the biggest. Somehow rumours about who was the top fighter started to grow between Jamelao and Capoeira, which led to a few street confrontations between the pair (at one point Rafael showed up at Jamelao’s academy with his students wanting to invade the academy – as reported by Eduardo on an interview to Tatame magazine in 2007). After many years of backwards and forwards arguments they decided to take their animosity to the ring (MMA rules), Jamelao defeated Capoeira by unanimous decision in December 2006. Jamelao had a reputation of being somewhat of a hot head, as his antics at the Mundial (World Championships) in 2001 showed. In his fight against Fernando Margarida (who would go on to win the competition) Eduardo stood up and walked away from the fight after he took Margarida down and the referee considered it a guard pull – not awarding the two points. He came back to the mat and fought until the end, in a fight that had moments where it looked like it was going to turn into a brawl. At the end after Margarida won the bout Jamelao refused to shake hands with the winner. Another example was in 2010 at the “5º Submission wrestling de São João da Barra” Jamelao walked out of the mat in the final against Victor Bonfim after a series of points did not go his way. In 2002 Eduardo Jamelão was one of the black belts that left the Alliance team to form the Brasa academy. In 2008 he would join the Vieira brothers to form the Checkmat team.